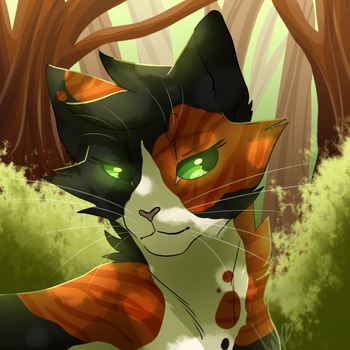 Appearance: Saffronpaw is a slender, long haired tortoiseshell shecat with vibrant green eyes. Her stomach and most of her chest are white aside from three patches of ginger striped fur and one patch of black striped fur. Her muzzle is white and her nose is a bright pink. Her tail is slightly longer and fluffy, much like her legs. Mutation: Like most of her clan, she has wide paws with large claws, night vision, and larger ears. Personality: A large attitude is one way to describe Saffronpaw, and it's probably the nicest way to describe her. While she is compassionate and very eager to help her clan, she'll often voice her opinions about conflict, even when they aren't needed or wanted. Sass practically drips from her muzzle, and she replies with more sarcasm than genuine emotions. That said, she does have some redeeming qualities. Such as her stubborn determination to help and her constant need to learn more about how things work, so she can cure them. History: Born to Silverflurry and fathered by Gypsumfang, Saffronpaw was immediately different from her littermates, Sootkit and Covepaw. It took until her eyes opened and she began to explore for her parents to notice, but she detested the play fighting of the other kits. Often turning her nose up at them. It was common that she'd sneak off and bother the medicine cats, more so Drywhisker than her brother, Sagecloud. When it came time for her to be apprenticed, she was quick to rush to the medicine den, telling about her dislike of conflict despite her attitude.